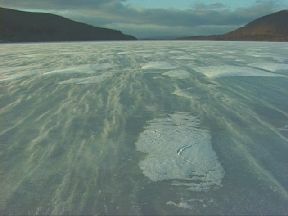 Images from frozen Lake Ainslie on Cape Breton Island. Snow blows over a frozen lake is surreal patterns, in a frigid winter landscape. Snow on the Lake has screened at the Videoforme and Manosque festivals in France, at VideoLisboa in Portugal, at FCMM (new media/new cinema festival) and Telescience in Montreal, at the Woodstock Film Festival in New York, at the Sao Paula Science Festival in Brasil and at the Festival Champ Libre, 2002 in Montreal.